As a wedding present many years ago, my parents gave my new bride and I their week in a timeshare (and the ability to trade it for a week someplace else). We scoured the timeshare trading company’s book (yes, this was pre-Internet) for someplace we wanted to go and, with my new wife still in graduate school, someplace we could afford. We identified Mazatlan, Mexico. Mazatlan in early January was the perfect place to escape to from cold Ohio (as a note, we had 2 inches of ice coating the car on our return and it took 45 minutes to chisel through the ice with my only tool, my car key). We visited old town, watched the cliff divers and took an inland tour. We drank copious amounts of Coco Locos (a rum based drink served in a coconut, husk and all) and sampled the great foods of the Mexican Pacific Rivera. One excursion we decided to go on was a Booze Cruise. The boat’s capitan was Arturo, and he had a first mate named Senior Goofy. Senior Goofy’s sole responsibility was to keep the booze flowing freely. He was VERY good at his job. The itinerary for the trip was to spend some time out in the harbor and then to an island right off shore. On the island we could do one of a number of activities (we rode horses on the beach) and then would be served a grilled dinner right on the beach. I forget the few choices that were available to us, because we both chose shrimp, and my life was never the same. I was expecting shrimp cocktail type shrimp. Pink. Cold. What I was served, was Diablo Shrimp. Grilled, spicy and the best seafood I had ever eaten. Several years later we purchased our first grill and I went in search of replicating that recipe. The closest I came is below. Use decent sized shrimp (16-20 or 21-30). Clean the shrimp. I also like to remove the tail, as it makes it a much more pleasurable experience for the diner. Skewer your shrimp. The recipe calls for also skewering garlic cloves, but I skip that in order to fit more shrimp on the grill. 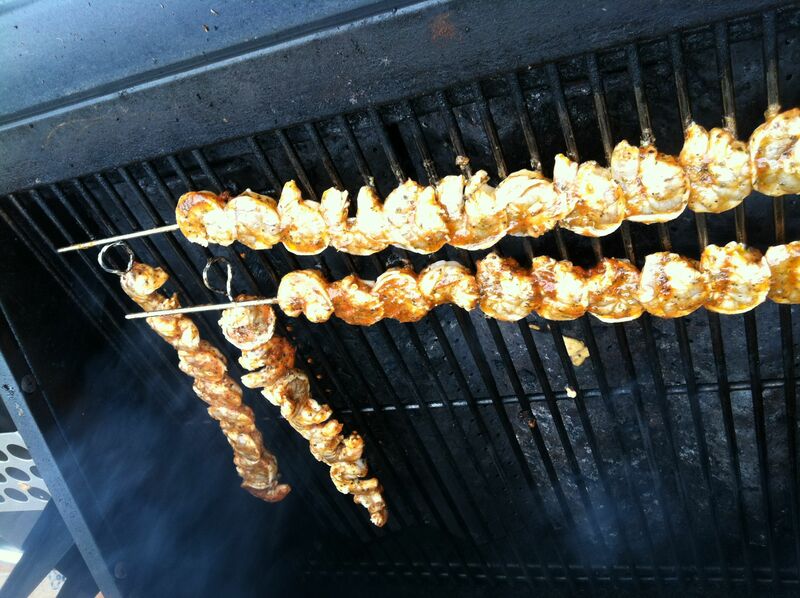 I like to marinate the shrimp after skewered. This way you can go from marinade to the grill and you don’t waste the marinade on your hands. 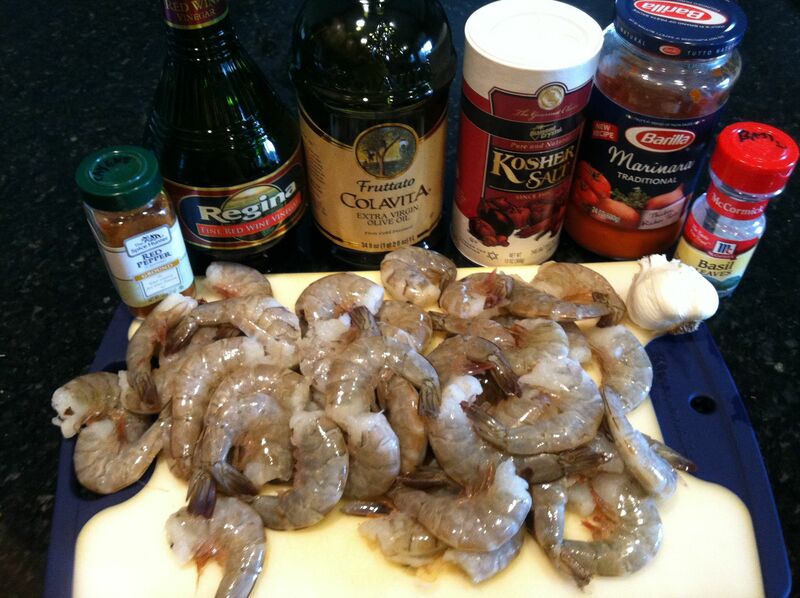 I will often double the ingredients for the marinade as I will use it to baste the shrimp on the grill. Grill the shrimp. Generally over a medium heat, I have found the shrimp need 3-4 minutes per side. Baste once on each side with left over marinade. Drop whole garlic cloves into a saucepan of rapidly boiling water and blanch for 3 minutes. Drain will and set aside. Peel and de-vein the shrimp. In a large bowl stir together the oil, tomato sauce, vinegar, basil, minced garlic, salt and cayenne pepper. Add the shrimp and toss to coat evenly. Cover and refrigerate for about 30 minutes, tossing once or twice. Preheat the grill. 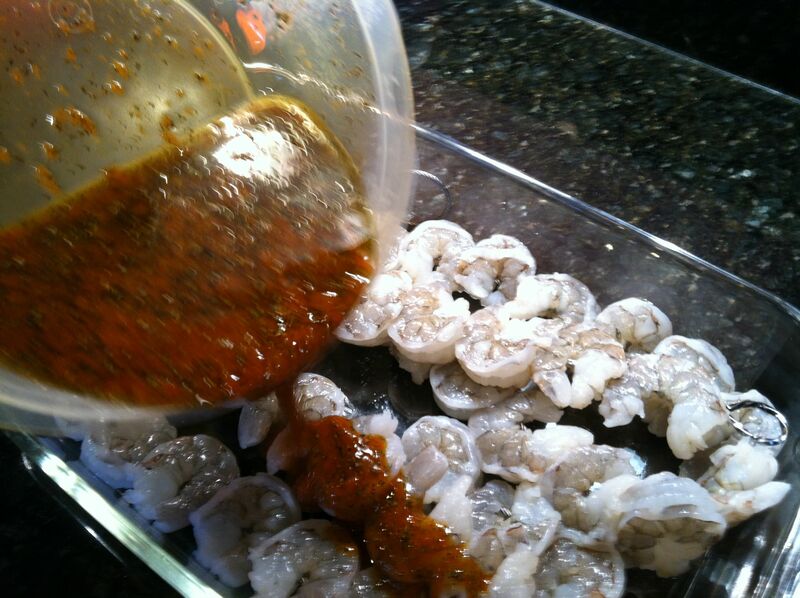 Remove the shrimp from the marinade and reserve. 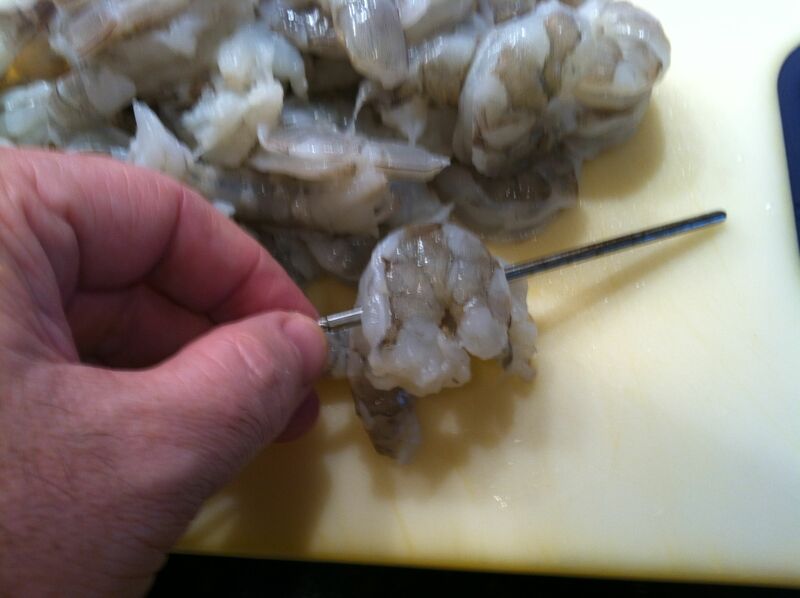 Thread the shrimp and garlic cloves alternately onto the skewers. Arrange the skewers on the rack. 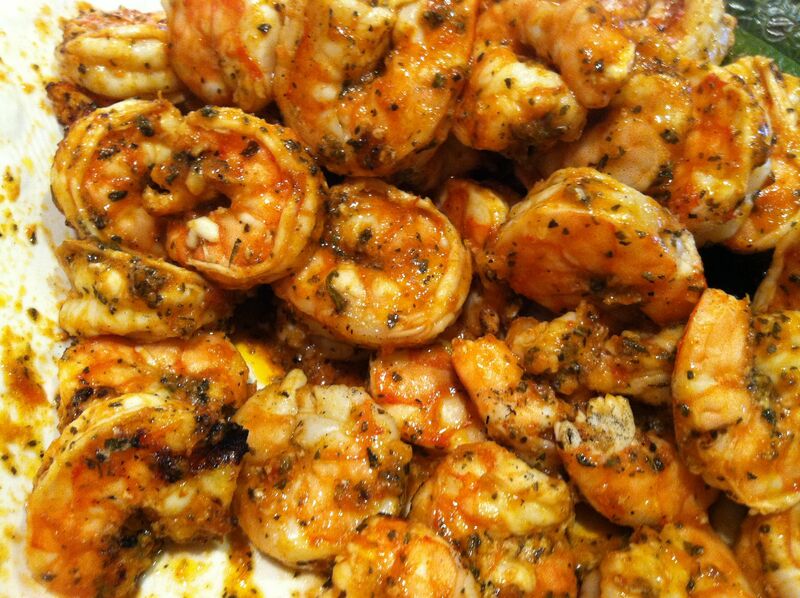 Grill, turning them frequently and brush with marinade until the shrimp turns pink, about 6 to 8 minutes. An idea for the seafood lovers. 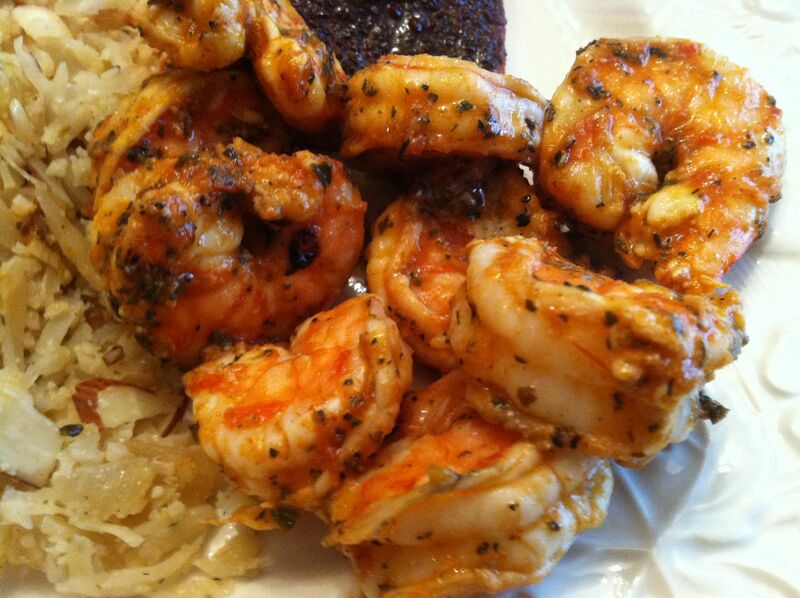 This looks wonderful, I am going to try this tomorrow if I can find some good sized shrimp. Thanks for this post! It’s snowing here, (I’m bummed) or I’d be out grilling. The shrimp looks amazing. I have to try it out! Those booze cruises always scared me a little bit. And you with your fearlessness now have a great food memory! I love this recipe! This one is a must try! Mmmm Tasty! I still have memories from when I was a kid of my parents coming home from Mazatlan and raving about the food they had eaten while there! Looks delicious! This is on the menu as soon as we get more propane for the grill. One must have one’s priorities in order and leaving off garlic to fit more shrimp is a very wise choice 😀 I’m sure your diners appreciate your taking the tails off too. The time taken, regardless it is seconds, removing them post-grill while trying to eat the scrumptuous, delicious little things, is torture! Rob is going to love this! I might have to double the recipe…. Thanks for the heads up on this shrimp! Garlic and Shrimp are a match made in heaven. The tomatoes and cayenne take this even further…sounds divine! This sounds wonderful! Shrimp is my all time favorite food, no matter how it is prepared, but this sounds exceptionally delicious! These look great – thanks for the story too! For grilling very large shrimp (10-15 ct.), a friend also taught me to grill them with the shells on; the shell holds the moisture in so the shrimp don’t overcook and so that they’ll have that wonderful firm texture. The shells are more easily removed when cooked, and the guest is rewarded by a jumbo treat that they can dip into a spicy sauce. I love a good booze cruise. That shrimp looks delicious. Now I’m hungry again. Ooh, yum-scrummy! Prawns (or shrimps as you call them in the US) are my number one favourite sea food! I might not be able to cook fish, and I might hate the idea of cooking raw prawns/shrimp, but oh do I love to eat the tasty pink mouthfuls that are prawns!! Do you do takeaway delivery?! Send me the plane ticket and I’ll bring the shrimp! I’m crazy for shrimp. I started drooling as soon as I scrolled to the first picture. Thank you for sharing! Thank you! having neighbors over tomorrow for late lunch – my daughter’s 6th birthday – and was planning to grill shrimp skewers with risotto and salad. Will use your recipe for certain. Can’t wait to try it! Love something new! Yum! I only wish I had the time to make this during the week! sounds good! and that vacation sounds like exactly what i need right now! That’s definitely a recipe I’ll have to give a go sometime! It’s reminiscent of the shrimp my aunt and I made one summer (though ours is probably nowhere near as good) while I was nannying for her children! Now to wait until it’s warm enough to use the grill here without freezing! This looks delicious. I think this is going on the grill the next time we cook out. Thanks for sharing. That looks wonderful. A must make! This looks delicious! I am definitely going to attempt this and probably slaughter it. Hey, Ranting, thanks for liking my blog. Your site’s great; love the recipes! Farmer D & went to the Riveria Maya in January when we got married (6 yrs. ago). Chiseling the car out from the ice when we returned to Cleveland was NOT FUN. I haven’t tried it. I would wonder if it would fall apart too easily. Instead of the grill you can put in on a broiler pan and broil it (just don’t burn it), as the broiler works like a top mounted grill. So glad I ran into this recipe on your blog. Going to have to try making this when I get back home. Dam! It sure ain’t ‘mutton’–wow. This I will have to try. Thank you. My husband & I went to Mazatlan on our honeymoon (a stop on our cruise). We hiked & kayaked there and enjoyed a few Pacificos. The best part of the day (other than the beer) was a tour of the city, in an air conditioned van that belonged to this guy named Juan Carlos. He stopped anywhere we wished, and gave us a really great tour of the city. I am jealous that you got to have some shrimp, it being the shrimp capital of Mexico. I’ll have to try this recipe! Hi, i think that i noticed you visited my blog thus i came to return the desire?.I am attempting to in finding issues to enhance my site!I suppose its good enough to make use of some of your concepts!! I must say that your Diablo Shrimp bear little resemblance to my Shrimp Diablo. I’ve been wanting to use the pound of shrimp left over from my Hoisin Ginger Shrimp and have been desiring to grill ’em. Looks like we’ve got a plan now! This looks delicious! Mmmmm spicy shrimp. This will be on my menu this week. Made my mouth water! Have to try it. Thanks for liking my post.I’ll be back! hi! loved the story behind the recipe – too bad can’t relate to the dish as am a vegetarian. I am vegan, by choice; but vegetarian by necessity. Nonetheless, I would risk possible reincarnation as a litter box for a gaggle(?) of Jumbo Shrimp just to try this dish! Bookmarked, and Rant on, my brotha’! I must make this with some fried rice! Yummy looking, right?